April 28 marks the one year anniversary of when I began my new nutrition habits—learning what ‘good nutrition’ really looks and feels like. 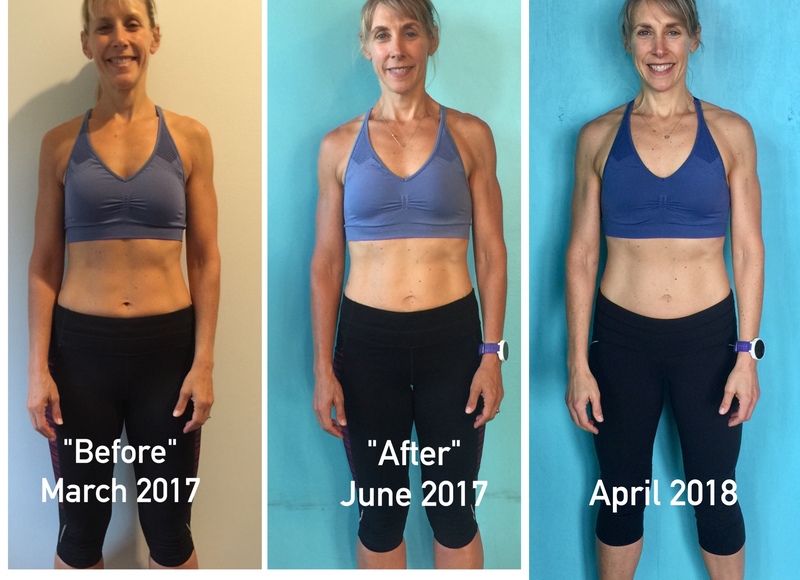 (If you want a refresher to put this post in perspective, read this first: “I Followed A Nutrition Plan for 60-Days. Here’s What Happened“.) What I have since learned is that good nutrition isn’t about ‘following the rules”, or ‘being strict’, or the numbers. Good nutrition is about enabling a happier, healthier and fuller life. Having experienced all four seasons with my new nutrition habits, I have come to realize that there is a natural ebb and flow with body weight and seasons—regardless of my best efforts to maintain energy balance. I’ve seen this cyclically happen in the past—Aug/Sept/Oct I’m at my peak athletic performance and lowest weight of the year. Enter winter, and energy balance becomes more challenging. My body wants to hold on to a few extra pounds and I get less daily movement during winter months. Of course there are numerous occasions to indulge with holiday celebrations and family birthdays. These events are a part of life, of living, but the difference now is that I know how to ‘right the course’. 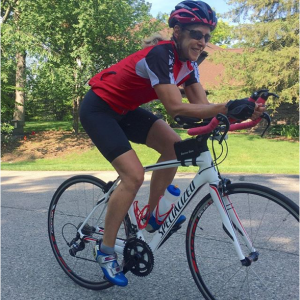 My general direction is forward and up, this cycling is just part of the process. I gain a bit more insight about myself from this cycling process. Sometimes we just need to ‘slip up’ to move forward. I have established a keen awareness of my nutrition choices. Some days I feel in control, others I do not and want to eat anything in sight. On days I feel challenged I can (mostly) recognize the emotions or event that triggers why I feel out of control. I consciously choose to have an indulgence—or not. This is a major breakthrough as I have lived the majority of my life thoughtlessly eating. Because I can recognize my ‘slip-ups’ I now accept them without guilt. Food is food. 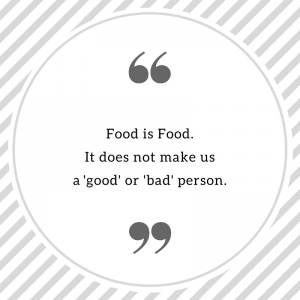 Food does not make us a ‘good’ or ‘bad’ person. As a result of cleaning up my nutrition—drinking lots of water, eating more green vegetables than ever, consuming lean sources of protein at EVERY meal, and choosing healthy fats—my body works more efficiently and I can feel that in my workouts, and in daily life. Overall I have more energy, and my skin looks healthier. Eating clean brings more sensitivity to food intolerances. For me, most dairy products cause bloating and gas. (Yup, these digestive issues are usually food related). I have to make a conscious choice if certain foods are worth the uncomfortable side-effects. I do love my pizza, I don’t eat it as often as I used to! I try my best to continue to eat each meal with attention and awareness; and practice intentional connection with my body—listening when its hungry, satisfied, or full. These have been the two most profound practices that I have learned over the last year. I had a tendency to overeat and suffer from the discomfort and guilt that came along with it. Not today. High-intensity workouts and high-intensity cardio are essential to maintain my desired body fat percentage. This breakthrough surfaced two months ago when I injured my back and had to limit high-intensity and heavy weight workouts—that meant no running, stair climbing, no swinging or squatting heavy kettlebells. 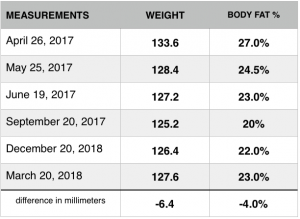 My nutrition and weight remained mostly stable with typical one-two pound fluctuations, but I watched my body fat percentage slowly creep up two to three percent. I’ve progressively incorporated 1-4 weekly high-intensity workouts back into my routine three weeks ago and already see a 1% decline in my body fat percentage. This is eye-opening, and verifies the importance of high-intensity workouts for maintenance and fat loss (not just weight loss) for me, AND clients! Over the last year, I have been able to maintain my new ‘comfort zone’ weight (126-127), which effortlessly slid down to 124-126 in my ‘peak’ athletic months! My old ‘comfort zone’ weight (131-132) is officially a thing of the past. I have only seen the scale go above 129 pounds a couple of times in 12 months (safe to say that was around Christmas time, and it was only temporary)! Good nutrition and smart workouts are here to stay! 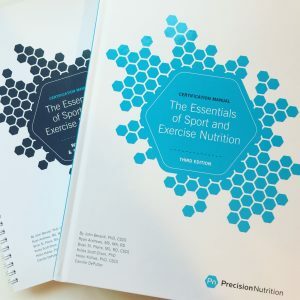 My journey over the last year and my desire to help my clients be the very best version of themselves has inspired me to pursue Precision Nutrition Level One Certification— it’s is the world’s most respected nutrition education program. I’m eager to continue to expand my skill set, as it will give me the knowledge, systems, and tools to really understand how food influences a person’s health and fitness! It’s incredible to see how much I’ve evolved physically and emotionally over the last year. This evolution also touches clients who have participated in AMC’s 60-Days of YOU! Fitness & Nutrition Program born in September 2017 after my personal nutrition breakthrough. This program has already supported 46 women whom have lost a collective 213 pounds, with most losing 0.5 to 3.0 inches in their hips & waists while participating in AMC’s Fit & Fab training sessions and following 60-Days of YOU! nutrition program. Additionally, these moms have new-found energy, and fulfilling new self-care habits while maintaining a healthier weight. AMC’s Summertime 60-Days of YOU! Fitness & Nutrition program— begins April 21 through June 19— eight weeks of fitness and nutrition guidance that will take the guesswork out of slimming down, getting fit and establishing a healthy relationship with food and exercise. There is still time to join us! Together, Coach Cassandra and Coach Katie will help you create a map for your new healthy habits and create a strategy to make them stick! Join us and make the commitment to honor yourself for the next 60-days. We have a few spots left! To lean more & to register.